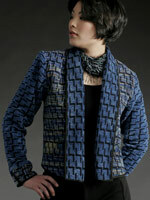 Baltimore, MD (February 19, 2006) - Artist Laura Fisher-Bonvallet has been selected as a winner in the 2006 NICHE Awards for the piece entitled "Mayapple Jacket" in Fiber: Handwoven category. 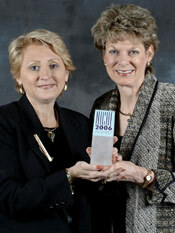 Winners of the NICHE Awards were announced at a ceremony during the Philadelphia Buyers Market of American Craft on Feb. 9, 2006. Only 191 artists out of more than 1,000 entries were named as finalists for NICHE Awards. Of that group, 43 artists won awards in several categories including ceramics, wood, metal, jewelry and glass. The Awards are sponsored by NICHE magazine, the exclusive trade publication for North American retailers of American crafts. The NICHE Awards program began in 1990 to recognize the outstanding creative achievements of American craft artists who produce work for craft galleries and retail stores. NICHE magazine is published by The Rosen Group, which also publishes AmericanStyle magazine, an arts lifestyle magazine for enthusiasts, collectors and travelers. The Rosen Group also produces Philadelphia Buyers Market of American Craft, the nation's largest wholesale craft tradeshow.